Winter is over, and spring is right around the corner. This is the time when families are going out into the fresh air with their children. April and May are therefore the strongest months for balance bike sales. They’re also often highlights as Easter gifts for the Easter holiday. 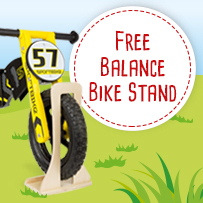 We’ve got a particularly special balance bike special for you: With the purchase of a balance bike*, we’ll give your our convenient Balance Bike Stand 10824 for free as an additional gift. And here’s how it works: Simply enter the code ExtraStand in the shopping cart, and receive product 10824 as a free additional gift. Promotional period: 27.03. – 17.04.2019, only redeemable 1x per customer number. From the most popular balance bikes for girls and boys and the price-performance champion to the classic bestsellers: In our „Balance Bikes“ product category, you’ll find a wide selection of balance bikes with which you’ll score points with your customers and boost your sales. Looking for a strong sales argument? Balance bikes train motor skills in young children moreso than almost all other toys. They’re the perfect preparation for riding real bikes, they train children’s sense of balance and coordination and they have a positive effect on the mental, psychological and physical development in children. They train children’s trust in their own skills, motivate them to go exercise in the fresh air and playfully train physical endurance as well as safe traffic rules. And what’s more, they invite kids to go outside and play! So stock up your assortment now!